For many brides, LeVian chocolate diamonds represent a beautiful, unique choice for an engagement ring. LeVian, the world-renowned jeweler is primarily responsible for the popularity of these gorgeous brown diamonds. The United States branch of Levian Jewelers was founded by Abdulrahim Ephraim LeVian in 1950, but the company had been creating fine jewelry since the 15th century. After its United States founding, the company was instrumental in popularizing turquoise during the 1970s and 1980s, and it was one of the driving forces behind the Tanzanite craze of the 1990s. LeVian is also famous for its "invisible settings," which are handset and designed to truly show off the stones. Today, LeVian focuses much of its attention on natural colored gemstones, like the brown diamond. In 2000, LeVian began an extensive marketing campaign to create and maintain demand for brown diamonds. Once considered inferior to white diamonds, brown diamonds are now a hot trend in engagement rings and other jewelry. This popularity is due in large part to the effective marketing of the chocolate diamond, but the beauty and versatility of the brown diamond have also played a role in capturing the attention of the public. Marketed under "LeVian Chocolatier," the brown diamonds are an integral part of many of the jeweler's collections. LeVian chocolate diamonds can be found in design collections including "Chocolate Diamond Truffle," "Chunky Chocolate Diamonds," and "Sweet Chocolate Diamonds." As you can tell from the collection names, LeVian understands that most women love chocolate almost as much as diamonds. The combination of the two seems only natural, and marketing of the chocolate diamonds has proven to be very successful. Mostly mined at the Argyle Diamond Mine in Western Australia, chocolate diamonds are now considered a new classic. They come in many colors, including pale cinnamon and champagne diamonds, rich cognac and honey chocolate diamonds, and deep, dark clove diamonds. The particular shade of chocolate diamond is dictated by the undertones of the stone, which can range from pale pink to a dark olive green. Chocolate diamonds are beautiful with many metals and gemstones. They are commonly set in various metals, including white gold, platinum, and yellow gold. Combined with stones like amethysts, topaz, and white diamonds, they make a striking accent for engagement rings. Chocolate diamonds are also featured as the center stone in many lovely rings. Because LeVian has popularized the chocolate diamond, many brides look for brown diamonds from this specific jeweler. However, other jewelers also make lovely brown diamond engagement rings. If you purchase your stone from another jeweler or from an individual, be careful to have the brown diamond examined by a trusted jeweler. Inferior quality white diamonds can be irradiated or heat-treated to change their color, resulting in a chocolate appearance. 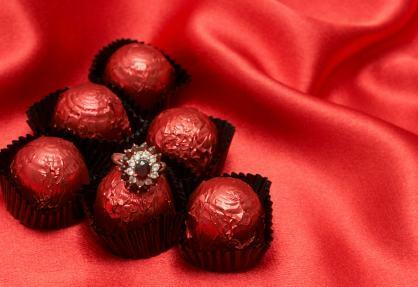 In addition, there are many artificial chocolate diamonds on the market. Making sure you have a genuine brown diamond takes research. Knowing about cut, color, clarity, and carat can help you make sure you get a beautiful engagement ring. Before you buy a LeVian chocolate diamond or any shade of diamond, make sure you have educated yourself about buying these beautiful gemstones.